Check out - Protect Your Waters for more information. We need volunteers to pull water chestnuts. We will be working down by the Ballfield and Dam area. Help us rid the lake of this very real danger to the lake habitat. Please feel free to pull these extremely invasive weeds on your own whenever possible. Native to Europe, Asia and Africa, water chestnut is an annual aquatic plant with a long flexible stem that can reach 12 to 15 feet in length. 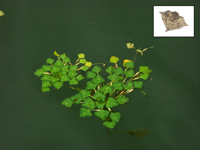 On the water's surface, the plant contains a circular cluster of sawtoothed edged, triangular floating leaves that are connected to an inflated petiole (bladder), which provides added buoyancy. Feather-like leaves can be found along the long submerged stem. The fruit is a nut with four 1/2-inch, barbed spines that can cause a painful wound if stepped on. Seeds can remain viable for up to 12 years. Water chestnut can be spread from the rosette and fruits detaching from the stem and floating to another area, or by fruits clinging to objects, birds and other animals. 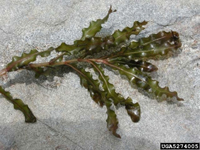 Curly-leaf pondweed is native to Europe, Asia, Africa, and Australia. The leaves are reddish brown/green, oblong, about 3 inches long, somewhat stiff and crinkled, with finely-toothed edges. The stem is fl at, reddish-brown and grows 1 to 3 foot long. The plant usually dies off by mid-summer. Though it can reproduce by seed, it primarily spreads through burr-like winter buds (turions) which break off from the plant. New plants grow under the ice in winter, giving it a head start over other native aquatic plants. Native to Europe, Asia and Africa, Eurasian watermilfoil is a very aggressive exotic and as since found its way into virtually every U.S. state and three Canadian provinces. Its items are usually 3 to 10 feet in length, often forming dense mats on the surface. Its bright green feathery leaves are finely divided and occur in whorls (circles) around the stems. Each leaf has 12-21 leaflet pairs (native northern milfoil has 5-10 leaflet pairs). Eurasian watermilfoil can spread by both seed and, most commonly, by plant fragments. The zebra mussel is a small, nonnative mussel originally found in Russia. Zebra mussels grow to about 2 inches in size. They can usually be identified by striping on their shells, although this pattern varies greatly to the point that some shells have little if any noticeable striping. Young zebra mussels are microscopic in size and are spread easily by water currents. These are currently in Lake George and are a real threat if boaters do not carefully clean their boats after visiting other waterbodies.